Cardi B performs onstage during the Coachella music festival in Indio, Calif., on April 15, 2018. Did you immediately catch the reference? The asymmetrical ponytails, sideswept bangs and all-white-everything trouser-and-duster ensemble—complete with the chiffon insets? Cardi B may have opted to keep her pregnant midriff under wraps, but did her Coachella look remind you of anyone in particular? The artist formerly known as Belcalis Almanzar is clearly a skilled shape-shifter. But recently, she’s been proving that imitation really is the sincerest form of flattery by remixing some iconic ’90s looks during the ongoing promotion of her top-charting debut album, Invasion of Privacy. 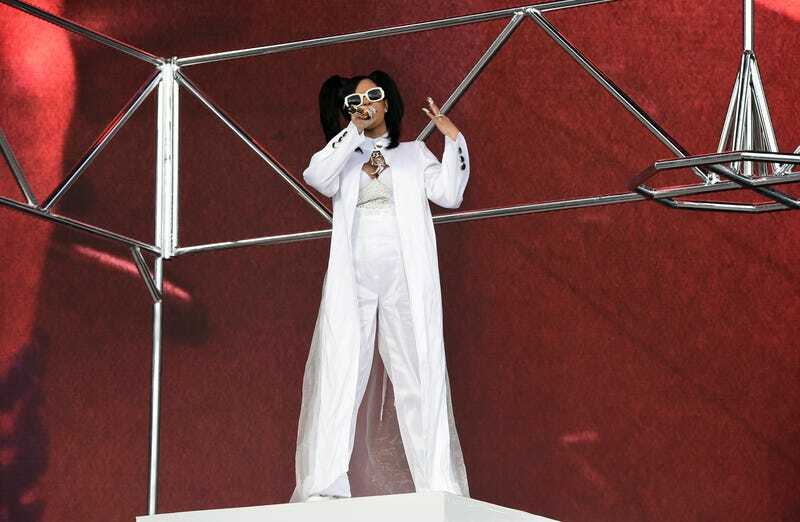 For Sunday’s performance at Coachella, Cardi B took over the stage wearing a white-on-white custom-made ensemble by Alejandro Collection that was highly reminiscent of outfits worn by platinum-selling group TLC to the 1996 Grammys (with a hairstyling nod to the group’s “Dear Lie” video). That evening, they were nominated for four awards, taking home two statuettes for the cultural zeitgeist that was their CrazySexyCool album. We’re not going to sugarcoat anything anymore; we’ve been quiet long enough. ... I’ll put it to you this way: We are the biggest-selling female group ever—10 million albums worldwide. We have worked very hard, we have been in this business for five years, and we are broke as broke can be. Though the delivery was casual, it was a horrifying and heartbreakingly honest admission from one of the world’s all-time-favorite music groups. The trio had fallen into a clichéd contractual trap with then-manager Pebbles, which effectively rendered them the last- and lowest-paid members of their own team, and officially bankrupt by the time of their most successful album. On the night of their biggest triumph to date, they’d decided to come clean about what success was really looking like for them. So was Cardi B’s nod to the group more than an aesthetic choice? While she didn’t take home either of the two Grammys for which she was nominated this year, from all the appearances, testimonials and cross-promotional deals, it’s unlikely that the music industry’s fastest-rising star will be declaring bankruptcy anytime soon—despite purportedly sinking approximately $460,000 into her pair of Coachella performances. If TLC’s music career is a cautionary tale, so far, Cardi’s has been more like a fairy tale. One thing’s for sure: TLC’s equal parts homegirl-and-ingenue aesthetic once helped elevate the image and trajectory of regular, degular, shmegular girls. Decades later, it’s a waterfall Cardi B is chasing all the way to the bank. Respect.